Jet Black Leather Machine is the first compilation to tell the Vince Taylor story, drawing from all his important musical moments, all the important phases of his music. His complete British recordings are married to the cream of his French-made material for the first time. ‘Jet Black Machine’, a UK single from 1960, is incredibly kinetic rock’n’roll. His powerful 1965 version of ‘My Baby Left Me’ is unmediated, as wild as it can get – did his French label think that this roar was the logical evolution of pop? His take on ‘Long Tall Sally’ is equally abandoned. ‘Hi Heel Sneakers’, also from 1965, is animalistic. Then there’s the creepy ‘Rock’n’Roll Station’, a 1976 collaboration with experimental musician Jac Berrocal. 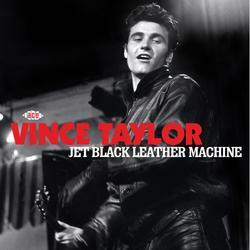 Extreme, multi-faceted and hyper-real, often at the same time, Vince Taylor was the Jet Black Leather Machine.